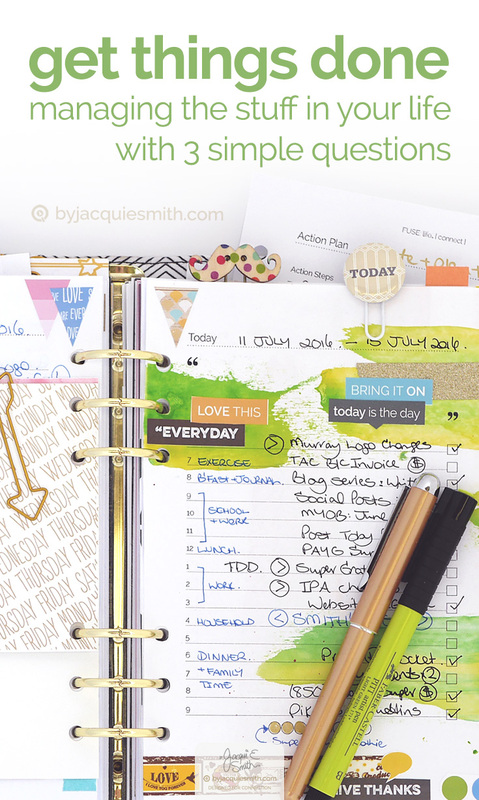 Getting things done, where do you store all your stuff + is there a better way to organise what comes into our life? Each of us have a different way of getting things done, yet we all strive for the same thing. We want to accomplish things + have our life mean something. I remember when computers first came in, I know that makes me sound old, at least it does to my son. People would sprout that they would make life easier, less paperwork and all that. I’m still waiting for that promise to be fulfilled! In actual fact I think it’s doubled what we take care of. We have so much more coming at us every day. We need a plan, a system of dealing with all this stuff so that we can enjoy getting things done. I’ve had this three step process swirling in my mind for a few years now. Each of these three steps has a question attached that leads us to the next step. When you answer all three you have a plan of action to … get things done. With these three simple questions we can more easily manage our stuff + enjoy our lives. So how do you go about getting things done? I know the simple answer is write them down + when you’ve done them, cross them off. Once we start adding in bills, birthdays + anniversaries, social events, work deadlines, forward planning, home projects, healthy habits, meal plans … it gets a bit more complicated. When you think about getting things done, what comes to mind first? 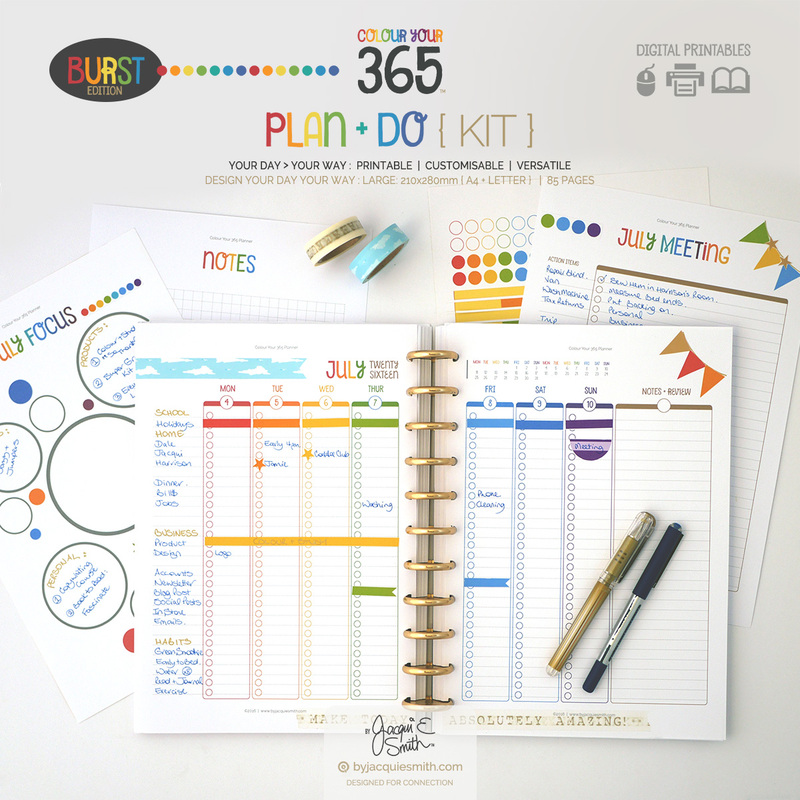 Your favourite planner, a special system or does the very mention of those words have you making a mental note of things you need to add to your list? Do you see the picture Kate lying in bed making her list in the movie “I Don’t Know How She Does It” too? Before we go any further I want you to know, there is more to you than getting things done! Your dreams matter. There are simple things you can do to clear the clutter + live a life you love. And getting things done isn’t just about having a planner + doing a bunch of tasks. It’s about how we manage our life + take care for ourselves. I don’t know about you but if there are piles of stuff lying around + I’ve had a bunch of late nights, I’m not all that productive + even a little irritated. Not a good combination for getting things done. So today I’m actually taking a step back from getting things done. We’re going to look at answering three simple questions to decide what to do with what comes into our lives, so that we can rise above the necessary mundane, enjoy what we do + live a life we love. No matter how we go about getting things done, there are three things we do with everything that comes in, we “ collect # reflect > connect. These three simple steps are what I call FUSE:life because it’s what we are doing when we blend together different pieces of our life into something meaningful, and ideally, a life we love. These three steps hold three questions we ask ourselves whenever something comes into our lives. So what are these three steps? 1. ” Collect : we collect stuff – events, thoughts, ideas, information + things. All those thoughts, ideas, appointments + things have to go somewhere. We need a place to put our stuff, physical + digital. 2. # Reflect : we decide what to do, most times in a split second. Whether we realise it or not, we reflect + ask ourselves (and others) a lot of questions. If we don’t have answers ready ahead of time or the space to deal with it in the moment, we end up with clutter. Clutter in our minds, space + computers. Ideally, the first place we put them should be where they will be useful + add value to our lives. I’m certainly not perfect at this. There are times that I don’t realise that I need to create a new space until a pile appears + begins to irritate me. While reflect may seem the most insignificant of the three for those of us who are “doers”, it’s actually the most impactful. Answer this question correctly + life gets a whole lot easier. Now that’s a life I love to live! 3. > Connect : we take action on it, sometimes straight away, other times a little later. We need a system for connecting what comes in with what we do. This is the step where it all comes together. We put our stuff into the appropriate place so we can confidently do what we need to. Each of the things that comes into my life goes through this three step sequence. I don’t always consciously think about each thing but I do go through this process whether I realise it or not. Most times it happens as it should + automatically. When that happens I know I have a process that works + I can enjoy what I do. When I see piles of physical or digital stuff that looks homeless, I know I haven’t answered these questions well. You can also have piles of resentment, annoyance + frustration. All of these piles alert us as to what needs our attention. They alert us to questions we haven’t clearly answered. Whatever the reason for the pile, there is something we can do to clear the clutter and set ourselves up to enjoy getting things done + living a life we love. You don’t have to wait until you see piles of clutter to make changes. When we can see what’s coming it makes it easier to answer the questions + prepare ahead of time. When we started home schooling a few years ago we knew that the spaces in our home needed to function differently. Making these changes ahead of time kept the family running smoothly + gave us time to prepare for our new lifestyle. Of course life isn’t always so obvious. Big changes like this are easier to see. It’s the little ones that can so easily sneak by us. When I see a pile whether it’s on my desktop, at the kitchen table or in my heart, I ask myself these three questions. They help me decide what to do with what I keep. They help me get things done. Over the next five weeks we will dive into these categories + see how we can best set ourselves up to enjoy getting things done + live a life we love. I look forward to seeing you next week as we start with events.